One of the leaders of democratic opposition of Uzbekistan, Nigara Khidoyatova, urges the opponents of the Islam Karimov regime to unite around entrepreneurial Bakhodir Choriyev. 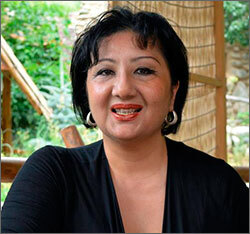 Ms. Khidoyatova discussed her acquaintance with Mr. Choriyev, a former farmer and currently a US-based dissident, in her article “On the enlightening example of an outstanding individual,” which was posted on the Birlik opposition movement’s website. In 2004, one of the like-minded partners, with whom we co-established the Ozod Dehqon Party, told me about a young farmer who was desperately battling with the government for his rights. I was closely engaged with peasants (whom the Uzbek government calls “farmers” for political reasons) at the time, and I knew very well that the administrative and command system turned them into mute slaves. It was, therefore, very rare to meet someone among them who would be prepared to stand up for their rights and against the authorities’ arbitrariness. I was obviously interested in personally meeting Choriyev. In May of 2004, I have arrived in the area where he lived and immediately saw plainclothes police officers near his apartment building. A young, well-built young man full of energy opened the door—he was Bakhodir. We were introduced and he immediately started sincerely telling me about the difficulties he had to go through. In 1999, the Choriyevs family purchased 60,5% of shares of the Kesh Joint Stock Company, which was the former kolkhoz in the town of Shakhrisabz. Bakhodir was appointed chairman of the company and his family invested over 18 million Uzbek soums into Kesh. Thanks to their labor, persistence and entrepreneurship, the new owners of the debt-ridden kolkhoz have turned it into a exemplary profit-making business, although it was a financial burden the regional budget until very recently. Seeing the success, the regional authorities decided to take Kesh away from the Choriyevs. They assigned a revision and inspection, which resulted in Bakhodir Choriyev’s conviction for several embezzlement charges. He was amnestied in 2002. His attempts to return the company failed. Having achieved no justice by legal means, Mr. Choriyev launched oppositional activities, a step that immediately identified a leader in him. By having such distinctions among the crowd of repressed Uzbek entrepreneurs, Bakhodir proved to the local authorities the sanctity and immunity of private property, and that he has enough courage and character to defend his property and dignity. Bakhodir shared his plans for staging protest rallies and our party’s political council decided to support him. The Uzbek opposition of today is not a solid and unified political force and its leaders strongly differ in political skirmishes and personal ambitions. However, there are authoritative opposition figures: Muhammad Salikh (Popular Movement of Uzbekistan), Bakhodir Choriyev (Birdamlik Movement), Sanjar Umarov (Solnechnaya Koalitsiya), Abdurakhim Pulatov, Nigara Khidayatova, Mutabar Tajibayeva and many others. While ideas on unifications are voiced often, so far they yielded no results. For instance, in May of 2013, ex-UK Ambassador to Uzbekistan Craig Murray urged the Uzbek opposition to unite under Muhammad Salikh’s leadership. The year of 2004 was noted for a surge in civil society’s engagement in Uzbekistan. The mass exodus of migrant laborers to Russia and Kazakhstan did not take place yet; international organizations and human rights advocacy groups as the Freedom House, the US Democracy Institute and many other entities were still active in Uzbekistan. All this was happening thanks to a bilateral US-Uzbekistan agreement on strategic partnership, which included democracy development. Various trainings were underway and residents of remote areas were happy to travel to Tashkent to learn the basics of democracy building and human rights. People then had optimism and confidence in tomorrow. The reforms also facilitated the establishment of a class of proprietors, which morphed into a middle class. As is known, any middle class criticizes the inefficient leadership of the country. A leader always emerges among such groups, having such qualities as courage to reach his/her goal, ability to formulate a model for behavior and thinking. Such a leader instills in his followers optimism and faith, and is distinct with significant interest and action for public good. I see all these qualities in Bakhodir. Indeed, one needs public recognition for political success, and that does not happen overnight. One needs persistence, courage and luck to achieve it. The bright star of Choriyev on the Uzbek society’s horizon sky scared the authorities on the one hand, and made the civil society happy, on the other. The Uzbek authorities’ repression of dissidents did not spare Bakhodir Choriyev and a serious threat of physical elimination forced him to leave Uzbekistan and seek political asylum in the USA. To my greatest sorrow, the interesting times of civic optimism lasted a very short time and fell into oblivion shortly thereafter. The regime overcame the embryo of democracy and painted its victory into the bloody red color of shooting the Andijan up risers. On that day, not only hundreds of people were brutally murdered, but their hope for bright and just future was also killed. Constant repressions achieved the results they were after: most active members of society left the country in despair. Political activists, human rights advocates, journalists, businessmen and men of faith had to flee the country. Although many years have passed since then, the middle class failed did not form in Uzbekistan. Those who were expected to be its backbone prefer either to leave the country and to establish their lives in a more stable country, or to compromise by forfeiting opportunity to promote reforms. Others use online social networks, preferring the virtual reality. Having left the country, Bakhodir Choriyev did not only hold on to his dream, but he also gained an opportunity to resume his political activity. And I must say he is at it with much energy! Is this phenomenal? It is, indeed. But the critical mass needed for political and social transformations does not exist in today’s Uzbekistan. I believe that if today, in such a momentous time, active Uzbek opposition fails to unite and support such an activist, as Bakhodir Choriyev, then tomorrow we will have failure and complete degradation instead of progress and democracy in Uzbekistan.